On Aug. 10, People’s Daily, the mouthpiece of the Chinese Communist Party, published an editorial that seemed aimed squarely at the former Party leader Jiang Zemin. 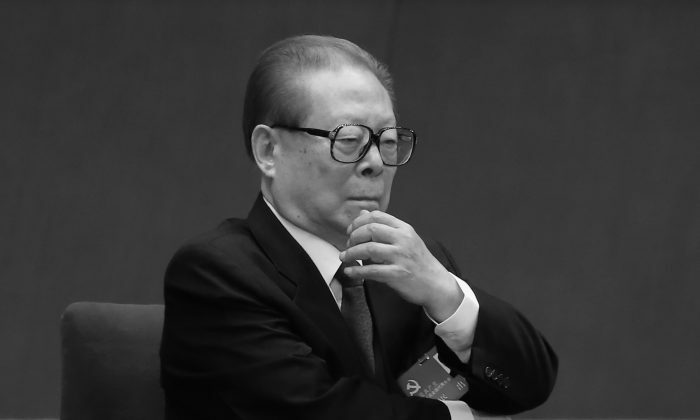 It didn’t name him, but it seemed that most everyone who follows Chinese politics was clear on what it meant: Jiang should stop meddling in contemporary political affairs. In the days following that editorial Chinese media were abuzz with interpretations and speculations on just what it meant. Editorials in People’s Daily have often served as important tools for top Party leaders to telegraph their thinking to one another, often in the context of political struggle, and to unify the thinking of Party cadres and the masses behind whatever the latest political line happens to be. People’s Daily followed up its editorial with two articles on WeChat, a popular text and voice messaging service by Internet company Tencent, about how senior Party cadres and foreign leaders retire. The two cases were supposed to be taken as didactic. Should this “revolution” of replacing “old and sick people” with younger ones end, it could lead to the “end of the Party and the nation,” Deng reportedly argued. The second post listed six foreign leaders—former United States presidents George W. Bush and Bill Clinton, former British prime minister Tony Blair, former German chancellor Gerhard Schröder, former Nigeria president Olusegun Obasanjo, and former Japan prime minister Naoto Kan—and their careers post politics. The Western leaders went into business, joined international organizations, or wrote books, according to People’s Daily. In contrast, Obasanjo and Kan went back into politics, the former more successfully than the latter—Obasanjo, a one-time military ruler, was democratically elected president in 1999, while Kan’s 2014 campaign for the Japan House of Representatives elections outside a train station in Kyoto drew no audience. In no case were any of these leaders identified as having attempted to interfere with the policies of a successor. Beijing News, a daily tabloid run by the Beijing municipal government, ran a piece on its WeChat account about former Communist Party leaders who preached or practiced good succession habits, and the influence of “big tigers”—the official label for high ranking Party officials targeted for corruption—while they were in power or after retiring. The survey of officials they chose to highlight seemed pregnant with meaning. During a talk entitled “Reform at the Party and the Leadership System” at the Aug. 18, 1980 meeting of the Political Bureau of the CPC Central Committee, Deng said Party leaders should not “endlessly” hold office. The recently purged former security czar appointed his trusted aides to different positions at PetroChina, where he worked for 32 years, and in the southern province of Sichuan, where he was provincial Party Secretary from 1999 to 2002. Jiang, a former high ranking Chinese oil executives and one of Zhou Yongkang’s proteges, helped others to obtain wealth illegally while he was at PetroChina. On the orders of Zhou Yongkang, Li abused his former offices of mayor and municipal Party secretary of Chengdu, the capital of Sichuan, to enrich himself and others. Zhang Lifan, a Beijing-based political commentator, told overseas Chinese language publication Mingjing News that gerontocracy—governing by a group of elders—has been an issue since Deng Xiaoping was in power. “As to how this will develop, what I worry about the most is the reaction from the military,” Zhang concluded. Mingjing regularly carries news of political scandal and rumor, including leaks from inside China, and is understood to be used by factions within the Party to publish information that is in their interest to disclose. In a commentary piece for Radio Free Asia, current affairs and political analyst Chen Pokong wrote that the People’s Daily editorial against Jiang Zemin in fact belongs in a trio of articles along the same theme, the first two being carried by Chinese news outlets with affiliations to Chinese leader Xi Jinping’s faction. Chinese business magazine Caixin discussed the fall of former military general Guo Boxiong in a July 30 article, and strongly hinted that Guo and Xu Caihou, another purged general, were “Chairman Jiang’s men,” according to Chen. Caixin is known to be “subordinate” to Wang Qishan, the anti-corruption agency’s boss and Xi’s trusted hatchet man, and often reflects his intent, while The Paper was set up by Xi Jinping and carries his “decrees,” according to Chen Pokong. Chen also says that the Party’s current in-fighting may not ultimately benefit any faction. “Once there’s a change in the situation, things may not play out as planned, even if those in charge didn’t intend for it,” he concluded. People's Daily issued a stern warning to former Party leaders who still meddle in the affairs of their successors.